Jane Austen and her Readers is a complex and illuminating study of the relationships between Jane Austen her readers. Part one explores Austens negotiations with her own reading, including the representation of reading in her novels. Part two investigates the responses of historical readers to Austens texts, from 1786 to 1945. 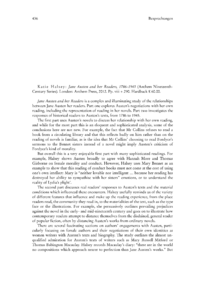 The first part uses Austens novels to discuss her relationship with her own reading, and while for the most part this is an eloquent and sophisticated analysis, some of the conclusions here are not new. For example, the fact that Mr Collins refuses to read a book from a circulating library and that this reflects badly on him rather than on the reading of novels is familiar, as is the idea that Mr Collins choosing to read Fordyces sermons to the Bennet sisters instead of a novel might imply Austens criticism of Fordyces kind of morality.